The poll in my sidebar is yielding some interesting responses. However, I was watching this Michael Voris video when suddenly the answer was given as if from on High! 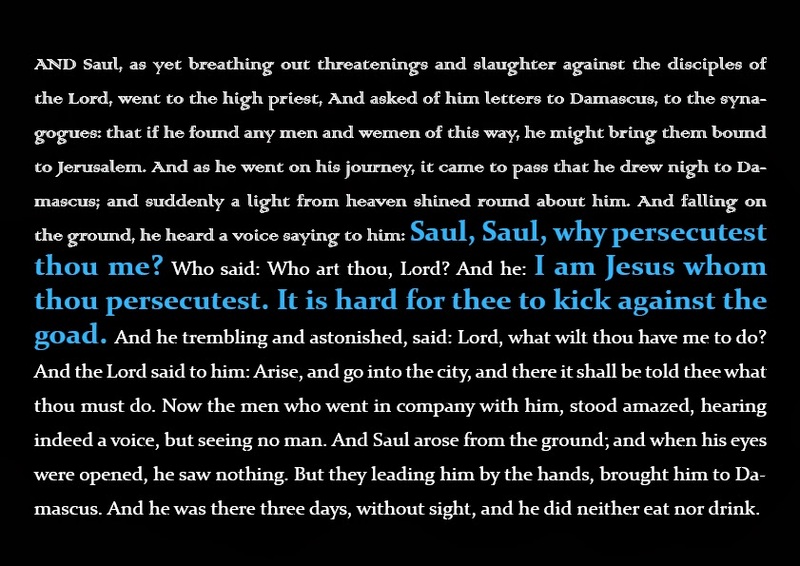 In fact, Saul became St Paul when he realised that God is a Catholic God since in persecuting His believers, His Body he was persecuting the Divine Person, the Second Person of the Blessed Trinity, the Lord Jesus Christ. To persecute a Catholic is to persecute Jesus Himself. Jesus is God, the Second Person of the Trinity. Ergo, God is a Catholic God. Feel free to discuss. After all...it is a 'new springtime', but don't stop believing! O Lord, I've just used a Sola Scriptura argument. Does that make me a Protestant? Sorry, what is confused or tenuous? 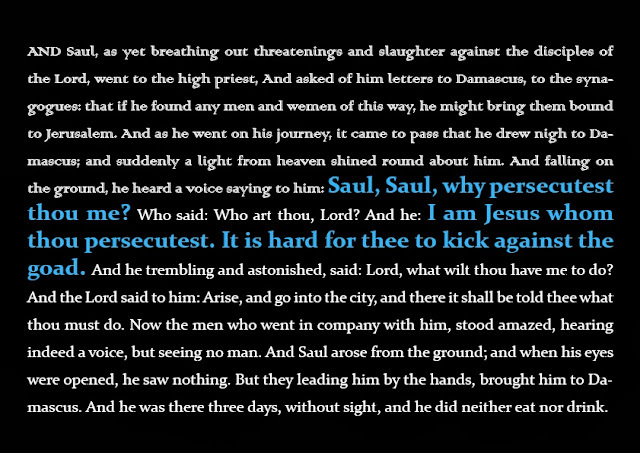 Jesus makes it clear that to persecute a Catholic is to persecute HIM. Perhaps you could 'think again' and refute my clumsy logic? If God, who is both Other and Eternal, Almighty and Lord, is also Man, why should the Almighty and Eternal Lord not be Catholic and Man? Dear Bones, why do you invite these people to "discuss" the truth that God is Catholic? I think the problem is that most people don´t know anymore what the term "catholic" means. There is only one universal (Catholic) God and He called everyone to believe in Him, to get baptised in order to join His Church, the Catholic Church, outside which there is no salvation. I don't think Christ was just referring to persecuting catholics in particular, but maybe other humans or even Christians generally. What we now know as the catholic church was not established until much later after this scripture quote. Find me a credible biblical scholar or theologian that agrees with you - and Michael Voris is neither. Jesus never used the word 'Catholic', you're putting words in his mouth. Because the Vicar of Christ has suggested He might not be. Jesus did not use the word 'Catholic'. But I am saying that He identified HIMSELF with His Church, which is comprised of Catholics who for His Body. I am just extrapolating the implication of Jesus's own words. You're making tenuous links, it's called apologetics not theology. Christ is indeed identified with his church, but it's another big jump to claim that God is catholic. The Saints have continuously taught that Christ and His Church the body of believers are so inseparable as to be ONE. Of course God is Catholic....it is so obviously true. The Catholic Church is persecuted and hated by the world, the heathens, the pagans and the false religions...the world and that list of entities hate the true God - Our Lord Jesus Christ and it is logical that they hate His UNIVERSAL CATHOLIC CHURCH - which they have have turned their back on. Having turned their back on the Catholic Church they have turned their back on God - God is Catholic. Well done Laurence. Spot on. That is why the One True Church of Christ cannot just subsist in the Roman Catholic Church, it IS the Roman Catholic Church, the Mystical Body of Christ. Who says so? Our Lord Jesus Christ himself - in the passage you have quoted - Jesus Christ who can neither deceive nor be deceived. The Catholic Church is the Mystical Body of Christ on this Earth CCC 790-795. Therefore anyone who persecutes the Catholic Church or a constituent member of it, persecutes Christ. It’s all quite simple really. You don’t have to be a theologian to work that one out. And, of course Christ is consubstantial with the Father if I remember right, constituting the Triune God. Get it? As far as I know, neither Peter nor any of the other Apostles had a PhD or ThD, or whatever exaggerated degrees theologians award themselves nowadays, which is probably why they were chosen. Of course you're right. I was told this when I was a child (and am now very old). Well, I have the reigning Pope on my side of the argument that God is not catholic. You won't find any credible theologian to agree with you. The church is God's sacrament in this world (ie a living sign of his presence that gives grace) but the church is NOT God. I fully agree and have a largish post about this topic that I'm preparing. When I read that claim in the Scalfari interview my hair just about fell out. It would be bad enough if Pope "I'll call anything I don't like Pelagian" Francis were a rigorous, scholastic thinker (which he's clearly not--Honey Badger Pope!) and had said "there is no Catholic God," since it's ontologically false. Had he said "there is no Muslim God," his meaning would have been clear (and true). But what makes it worse is that he was certainly just channeling that "prophetic ... father for the whole Church", the late Cdl. "God Is Not Catholic" Martini, whose deflationary biblicism is surely to the pope's liking. Oh dear! Are you really saying that remarks of the reigning Pope are more important than the teachings of Our Lord Jesus Christ. I do hope not. You have less than no warrant to cite the Scalfari interview as being "on your side". Not only is it not a declaration of magisterial authority, but Francis himself has expressed regret for it. To see a Catholic so glibly endorse that interview, or any of the other papal improv sessions, literally makes me cringe. The argument is *not* that "the Church is God" but that God has irrevocably *wed Himself* to the Church qua the integral Act of His redemptive self-disclosure. The two are one flesh and must always be held in nuptial unity; let no man summer what God has joined. To say that "the Church is God" is a monophysite red herring, while to say that God, towards us (quoad nos), is not necessarily of a Catholic form, is a Nestorian disaster. The truth is theandric (hypostatic union): there simply is no God who does not act in the form of the Catholic Church, and the Catholic Church has no existence whatsoever apart from its being the integral expression of the saving power of God. The Church is divine and God's nature ad nos is intrinsically ecclesial. We believe in one, holy, universal, and incarnate Church, and all these attributes apply to the God in whom we believe. To say that God's saving acts are not confined by the visible parameters of the sacraments is also just to say that the saving efficacy of the Church Herself likewise also overflows her visible effects. It's an extremely elementary metaphysical point which only the pied-piper-induced cognitive dissonance of soft ultramontanism can obscure. No effect can arise from a cause that does not first contain the principle of that effect. The Church is the very scope and entire means of salvation, and its sacramentality is nothing less than the actuality of God's mercy in spacetime. There simply is no other means by which man is saved than the Incarnation and the Church is nothing less than the metaphysical "expansion" of that reality over all history and culture. Pointing at the Eucharist as an irreducibly Catholic reality is simultaneously to point at the living God as the principle of all such Catholic reality. To point at the Catholic sacraments is nothing less than to point at God. "See that Catholic thing over there? That's God. Do you wish to know God as fully and as definitively as is possible this side of the Eschaton? Embrace the Catholic Thing." Terry - I'm not elevating the remarks of any Pope over Christ at all BECAUSE THE TEACHINGS OF JESUS CHRIST OR THE SCRIPTURES DO NOT CLAIM THAT THERE IS A CATHOLIC GOD OR THAT GOD IS A CATHOLIC. Pope Francis is quite correct and totally orthodox in this comment. Old codger - I must say that your linguistic diatribe sounds remarkably similar to Paul Priest on a bad day! Catholic answers says to this question: Since Catholicism is a religion, and religion is man's way of reaching out to God, God is not catholic. The Church is a gift from God to use in order to know, love and serve him. However, in an other way it is possible to say that God is catholic in the sense that catholic means universal and God is universal; but it is incorrect to claim that there is a Catholic God. I would also say that it is not the authentic teaching of the Catholic church that it is the 'very scope and entire means of salvation' and there is no other means of salvation. Read the teaching of V2. God is not religious, He is the object of religion. Therefore God is not a Catholic. I don't think G_d needs to follow any particular religion. The practice of religion is for OUR benefit so that we can come to understand what G_d expects of us and love Him and His creation based on this understanding. So it is we who need to follow our religion in the service and love of G_d so no G_d is not a catholic. God is the object of WORSHIP. You think that the Catholic Faith is a religion. Yes, but religion serves a purpose. What do you hope to be doing for eternity but worshipping God? The Catholic God who unites Himself to His Catholic Church! There is a very serious incoherence of logic in this claim. Why would the creator need salvation? It makes no sense that he would be a follower of any religion. If you're trying to drive at Catholicism being the true faith then that is a different question which primarily falls on what you believe regarding Jesus Christ but it does not depend on God being Catholic or there being a Catholic God..
God may unite himself to his church but that does not make him a catholic. God is the object of religion whose purpose is to worship him. God has no need to, and does not worship himself. Cardinal Martini: I find the formula 'Catholic God' unfortunate, almost as if the theologies of the 'Catholica Ecclesia' represented an undue appropriation and loss of the divine, instead of the loving and jealous spiritual and hierarchical solicitude for what has been revealed in Jesus Christ. You cannot make God Catholic. God is beyond the limitations and definitions that we establish. We need these in our lives, that's obvious, but we must not confuse them with God. The humanity of Christ was also a "gift" and a "response" to the saving act of God, but I hope you would not deny there is no Catholic Jesus. My points draw from the depths of the Church's metaphsyical and liturgical wisdom. That you call it a diatribe only speaks ill of you. That you offer proof texts from Catholic Answers to the points I made only speaks worse still. Please show in detail where my analysis is flawed and then, or rather, above all, please read Fr. Keefe's _Covenantal Theology_. Lawrence - if you have a problem with Pope Francis' comments or do not understand them, why not write him a letter? He will probably write to you himself to explain this 101 of Catholic teaching. I think you show a remarkable misunderstanding about the nature of God and the nature of the church. It must be all that semi-schismatic poorly formed quasi SSPX 'theology' that you have been absorbing! Sorry, try again. St. Thomas clearly teaches that God pre-contains as principle all perfections as effects. Insofar as RELIGION is a VIRTUE (cf. ST IIK-IIae q. 101, a. 3 and q. 121, a. 1 on "pietas") it is pre-contained in God. As such, to practice Catholic piety is to partake of the divine nature. Tell me one canon of the creeds with which God disagrees? Tell me when Jesus has not shown up at a Catholic Mass? Where God is, there is the Catholic Church; where the Catholic Church is, there is God. Can we pleas stop carrying water for our Martinian pope on such ridiculous matters? To say that there is a Catholic God is incorrect because it suggests that there are other Gods eg a Muslim god or a Jewish god or a Hindu god or a Protestant god etc. There is but one God who is. This is the orthodox teaching of the Church. I've seen one wag try to refute the plain logic by asking, "Is the Queen a subject of England?" He's a bit slow, by his own admission, and so his 'objection' is utterly irrelevant. To say that the Queen is not a subject of England is not only questionable in its own right, but also misses the point that her supremacy IN NO WISE negates the fact that SHE IS ENGLISH. Likewise, to say that, because God is greater than the Catholic sacraments, He is not Catholic, is as (in)valid as saying that the Queen's authority over English law renders her non-English. Rather, she is the most English subject of the realm, of whom all other subjects analogously mirror. As with the Catholic God. Lol, this is the stupidest posting I've ever read. I literally had to register to comment on it. Of course the pope doesn't believe in a "Catholic" God. We aren't Henotheistic, we don't believe there is a "new" God for every religion. There is but ONE God, and as the pope said he has made himself known through Christ! I have put this blog post on my facebook wall. Apparently this has caused some unease in Catholic circles because of the phrase "not in a Catholic God, there is no Catholic God". Does this suggest some kind of indifferentism in which the Catholic understanding of God is no better than any other? A generic God without qualities that everyone has some insight into? No. Actually, I think people are wrong to see this particular statement as problematic. There is, obviously, only one God. Or as Francis said, "[T]here is God and I believe in Jesus Christ, his incarnation." We, as Catholics, recognize that the Church provides us with the most complete and accurate understanding of God's teachings available to us as human beings here on earth, and also with the body and blood of Christ through the Eucharist. But God Himself is not sectarian. He is not "the Catholic God" or "the Christian God" as if there were other gods or other ways of understanding God. He is simply God, and the Church is the way to understanding of and union with him. We use the phrase "the Christian God" at times, as a shorthand to refer to the Christian understanding of God, and there's nothing wrong with that. I'm sure that I've used the phrase plenty of times. But I think there's also a value, as Francis does here, in underlining that God is not some cordoned off thing relevant only to Christians or Catholics. There is the objective existence of God, and all our doctrines are simply an attempt to describe that existence. But God is primary and the Church is a response to Him, not vice versa. This is not, clearly, something that orthodox Christians need to be reminded of. But it is, arguably, a point worth making with a non-Christian who is claiming that he believes in "Being". Our doctrines don't consist of believing in some restricted Being relevant only to us Christians. Rather, the teachings of the Church describe that Being, God, and His encounter with us through the Incarnation. The Church's teachings represent the completion, the end point, of any sense that God is out there somewhere. As Paul said, the unknown god is no longer unknown. We know him. In the context of the conversation that Francis is having, it seems clear to me that what he's saying is, "Look, the God we Catholics talk about is not some relativistic thing that only has relevance to us. He is not a sectarian God which you can ignore because you are not Catholic. God is the one great fact, a fact that even without quite knowing it you have identified. And it is the Church which has the full understanding of that fact, that God came to us in the Incarnation, that He loves us, that he desires us to be perfect that we may be happy with Him forever in heaven. I don't think that Francis is trying to disassociate God from Catholicism, but rather to make the point that God is not a creation of religion, but rather that religion is a response to God. God is the objectively existing Being. Yes, there's a sense in which he's aiming to get Scalfari to acknowledge the existence of God before working on the question of whether the Church is the one fullest means of approaching God, but he's doing that in the sense of insisting that God precedes religion, He doesn't precede from religion. I find your strange beliefs disturbing. I don't think we share the same Catholic faith. So I will not respond or comment further. God Bless. Terry - I would agree that your understanding of the Church and God is lacking. You know that you have strayed from the church's authentic teaching when you disagree with the Pope on basic matters of catechism.